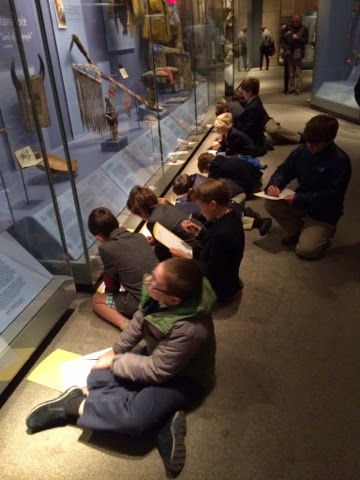 Yesterday, fifth grade boys went with their Spanish teachers to El Museo Del Barrio on 5th Ave. The boys, who have been taking Spanish through our Spanish immersion program since they were in Pre-K, continue to study not only the Spanish language, but also the cultures of Spanish speaking people. 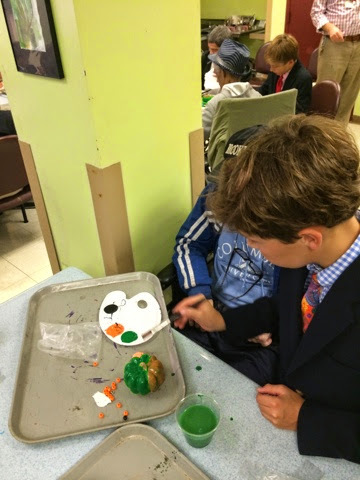 At the museum, they learned about the Dia de los Muertos (Day of the Dead), a holiday observed in Mexico and other regions with Hispanic populations, on October 31, November 1, and November 2. Museum guides led the boys in observations of three typical, private ornate altars that families build to honor the deceased. 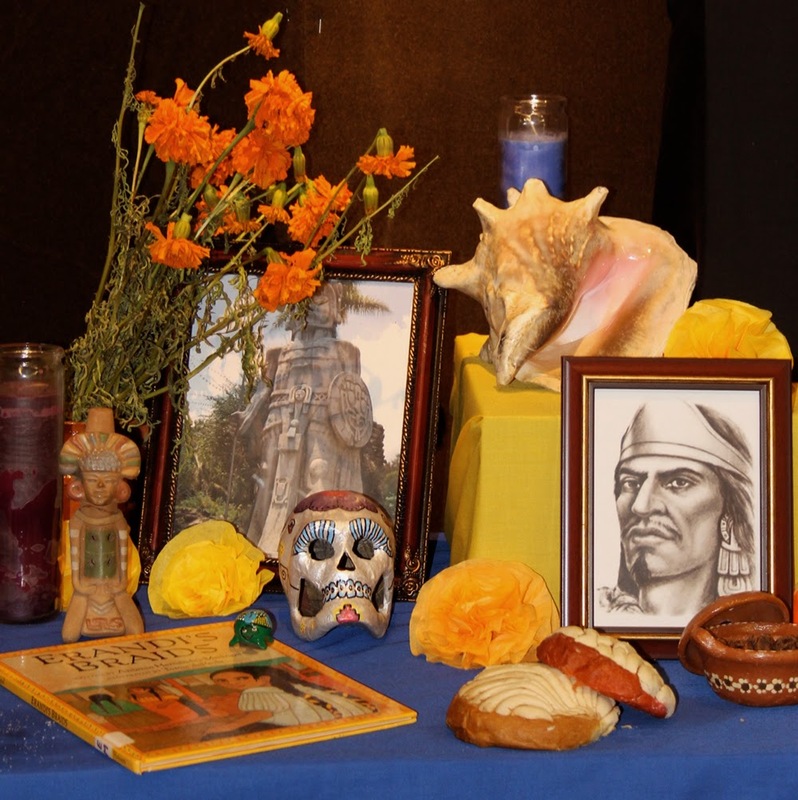 The altars feature marigolds, butterflies, sugar skulls, day of dead breads (pan des muerto) and items that would be significant to the loved one. The boys also saw Catrina, the skeleton female who is an icon of the holiday. Boys answered questions about the exhibits in Spanish, sketched features of the altars, and discussed the meaning behind many of the items they saw. This past Wednesday, the all-women a cappella group, Whim ‘n Rhythm, gave a class and performance for the Saint David's School Chamber Singers. Eleven members of the group, all seniors at Yale University, performed; brightening up what was otherwise quite a dreary, dark morning. Our boys were all thrilled to join the Whim for a vocal warm up that got everyone singing together. After limbering up their voices, our Chamber Singers performed Riu Riu Chiu for the ladies, with one of our boys taking the baritone solo. The Whim then performed four songs for the boys, who were riveted by their stage presence and vocal quality. The class ended with a Q and A session. The Whim then went upstairs to open 7th & 8th Grade Chapel with their featured song. Again, the boys were rapt. 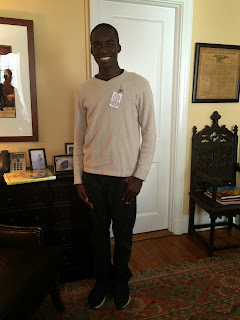 I had the great pleasure of spending time with Jevon '11 at Brooklyn Friends yesterday. He's finishing his senior year. Neuroscience is a field of particular interest. We also got to see James '11 at Packer Collegiate. Thriving, James is interested in a multitude of colleges. 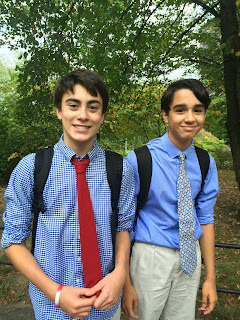 It was parents weekend at a number of boarding schools last weekend, after which several schools gave their students a day or two off. 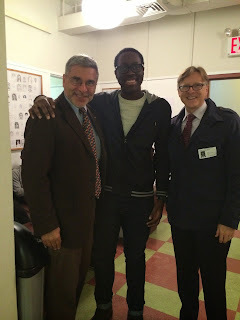 Many of our alums chose to visit their Alma mater including Peter '13 from Hotchkiss, Harry '14 from Middlesex, and Will '14 from Millbrook, who, by the way, recently launched his new band. Unfortunately, my photograph of Will didn't turn out. Sorry Will. Last week, our sixth graders spent two days at Camp Ramapo in Rhinebeck, NY, where they embraced the "Challenge with Choice" philosophy of the Camp. 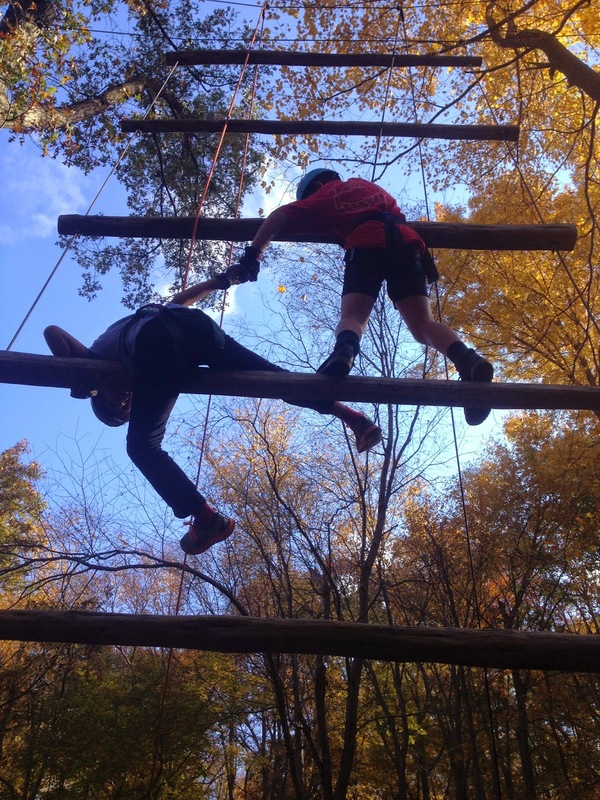 During their stay, the boys engaged in a series of physically oriented challenges and trust- and team-building activities including zip-lines, and high- and low-rope courses. In one challenge, they were asked to work in groups to figure out how to swing from one platform to another without touching the ground. Throughout the trip, boys relied upon each other for safety and guidance as they addressed all the outdoor challenges presented to them. 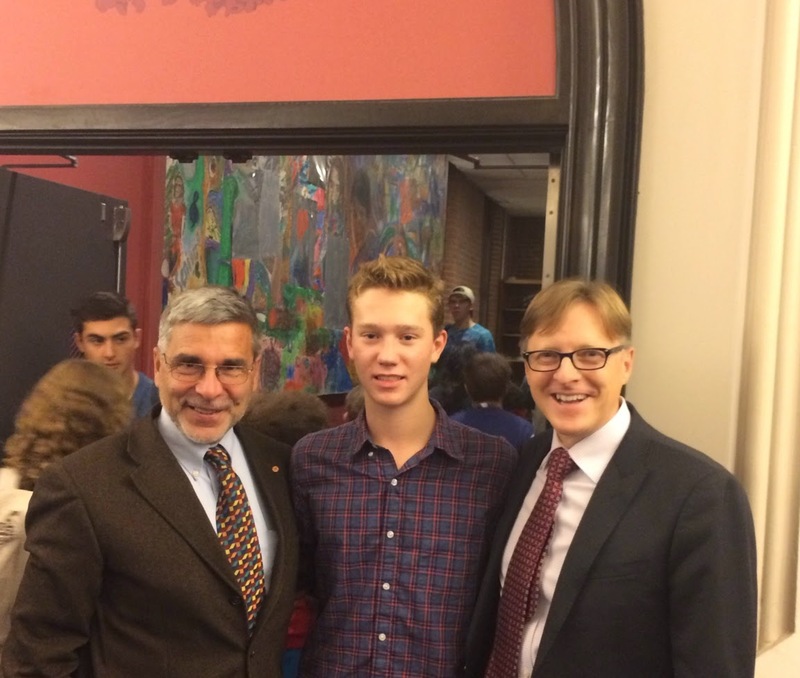 The experience at Ramapo is an example of concrete ways that thinking can be made visible, as the boys' ideas are put to the test in tangible ways. It also reinforces the value of working cooperatively and sharing ideas to solve real problems. 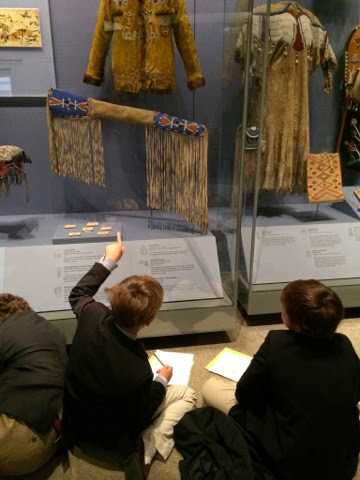 Fifth grade boys went on a newly introduced field trip yesterday to the National Museum of the American Indian in downtown Manhattan. The trip coincides with the boys’ study of the cultures and contributions of specific Native American tribes. At the Museum, they listened to cultural interpreters describe different aspects of the Inuit, Iroquois, and Sioux societies. While investigating drawings, animal skins, and a variety of indigenous tools, the boys learned about how each tribe maximized natural resources throughout its physical surroundings. 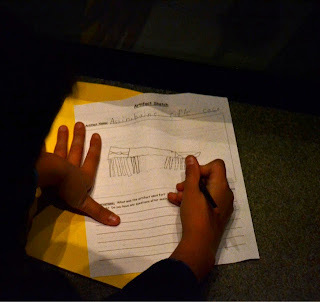 To conclude their trip, the boys sketched different artifacts on display in the museum’s “Infinity of Nations” exhibit. Sketches will be displayed during the fifth grade’s upcoming Native American Research Presentations. Our seventh graders and their teachers are at Cape Cod for this week, where they are engaging in interdisciplinary learning focused around the science of the ocean. The boys are exploring the seashore, studying marine life and adaptation, writing daily in their journals, and continuing to hone their observational drawing skills. The boys will also attend program events with the Woods Hole Oceanographic Institution and work in teams on the Critters STEAM project. This experiential exploration of the ocean ecosystem enables ideas to flourish as the boys observe, discuss, analyze, and create. 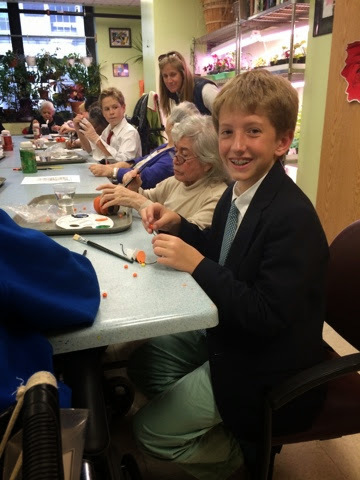 The experience also provides them with a special opportunity to bond further with their fellow classmates, as they settle into their penultimate year at Saint David's. 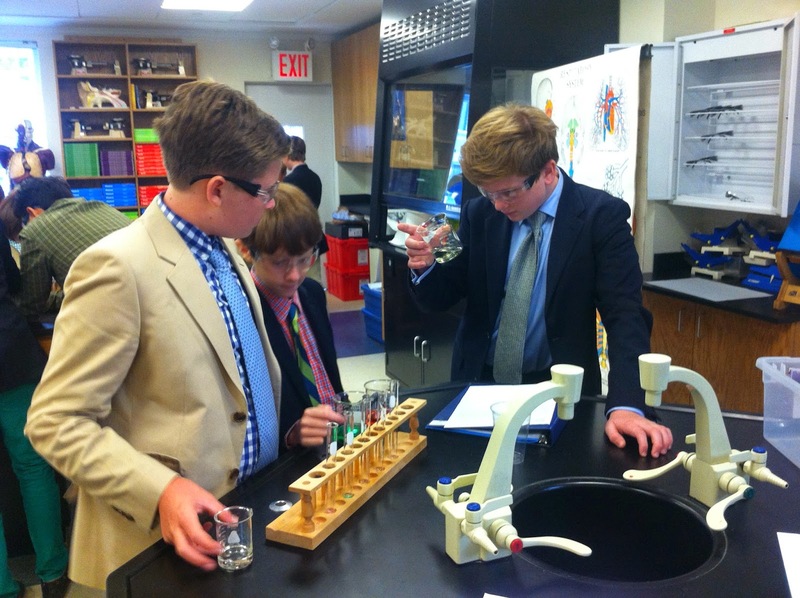 Our seventh graders were problem-solving detectives in a recent science Mystery Lab. Their challenge: to re-create a picture of a beaker with four different liquids resting in separate layers. To do this, each team was shown a photograph and then given the following materials: four large beakers of mystery liquids, beakers, test-tubes, a dropper, a clear plastic cup, a piece of pasta, paperclip, pop sickle stick, and a marker top. The boys then embarked upon a lab investigation to find the relative density of the four mystery liquids, and the solids. Once they solved these problems, they then re-created the picture. In the evolution of the “Critters” project, I started out with no particular central question in mind. I did not even know very much about STEAM. I was doing work directed toward my personal interests as a woodturner. 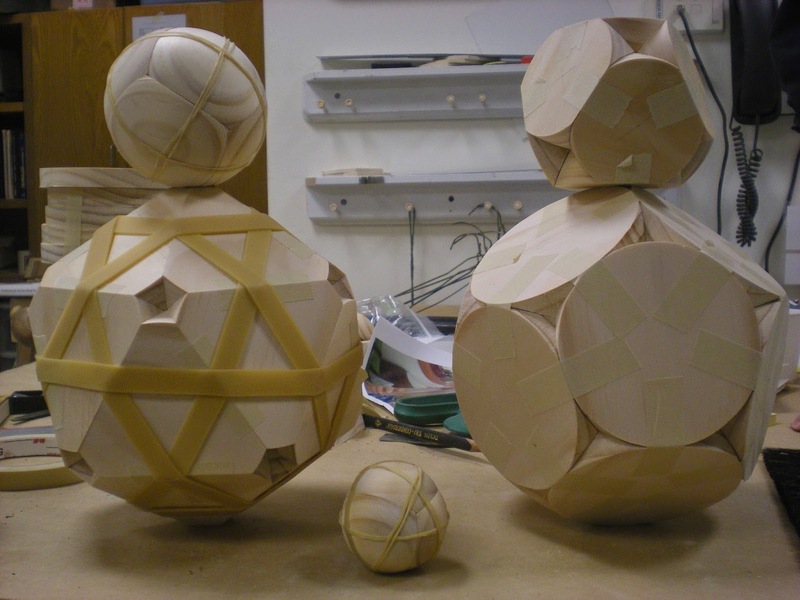 I have some background in geometry and wanted to see if I could develop a satisfactory method for constructing hollow wooden spheres (i.e., balls) from turned plate sections. I would cut carefully mitered pieces on the band saw, round them inside and out individually on the lathe, and later glue or otherwise fasten these “shells” together to complete a hollow sphere. I had in mind, however, that my students might use a much simpler method, with regular classroom materials and tools, to express essentially the same geometry. For me, this type of thing is both fun and a worthwhile challenge. However, I also had to consider how such a project would be appropriate for the boys, and whether they would find it enjoyable. 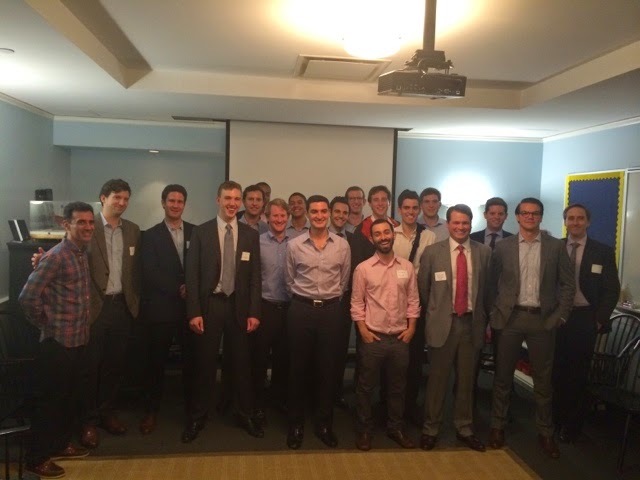 Just left an inspirational meeting with some twenty or so young professional Saint David's alums who have returned to their Alma Mater to form a Junior Board for Horizons. Their energy and enthusiasm is contagious. They are planning fund raising and other promotional events and direct engagement activities for the Saint David's Horizons program. We are fortunate indeed. What a strong, impressive community we enjoy. Examples of active learning abound at Saint David's. This week our youngest boys assumed the role of farmers for the day. 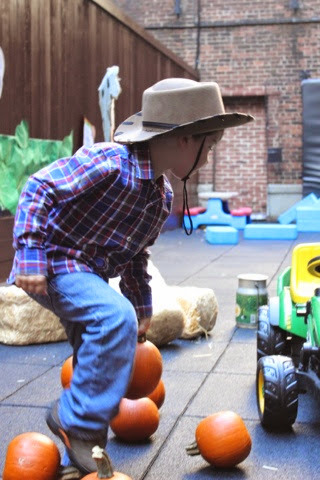 In our backyard courtyard, the boys drove toy tractors to the pumpkin patch, tended to their cow, and played a game of "pass the egg" without cracking it. Shortly, the boys will study and witness the hatching of baby chicks in their class. 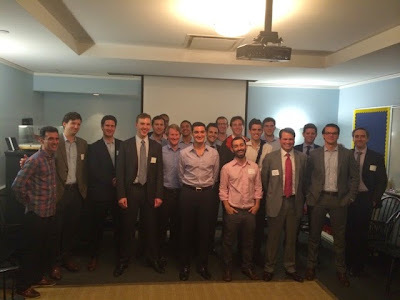 At the same time our Omega boys spent a Spanish immersion class exploring all things baseball, including singing “Take Me Out to The Ballgame” in Spanish, mimicking the actions of a pitcher, hitter and catcher; and dressing a puppet as a NY Yankee player; all while communicating exclusively in Spanish. 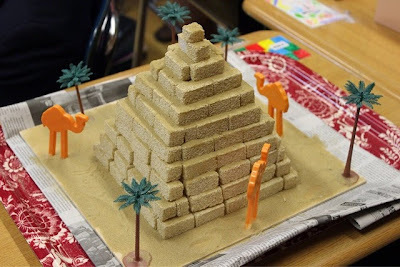 And our fourth graders, who have been studying the ancient civilization of Egypt, gave presentations on a related topic, such as The Great Pyramid of Giza, Pharaohs, or Mummies, while assuming the roles of art historian, cartographer, or biographer. All of these activities engage our boys actively, getting them up, out of their seats, moving, working cooperatively, and speaking publicly. I'm with the 6th grade volunteers at Cardinal Cooke. 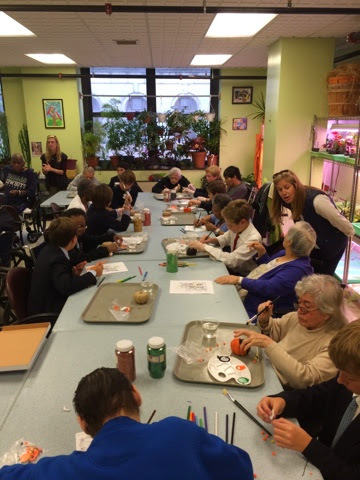 The boys are working with residents on Halloween themed decorations. It never ceases to amaze me how quickly engaging the boys become with total strangers--they're communicating in Spanish, sign language and exaggerated facial expressions. This is their first visit. I'm so proud. 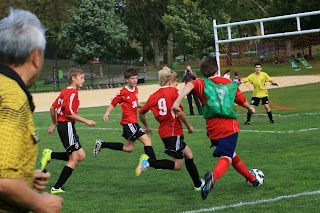 Both Saint David's teams played hard against St. B's in their biggest game of the season in Central Park yesterday. The Osgood Cup, unfortunately, will be placed upside down until this time next year. It's been up for the past three. I suppose a rest was warranted. The boys played hard. It was a shot on goal in the last 50 seconds that clinched the game for St. B's resulting in a 3-2 loss for Saint David's Red. 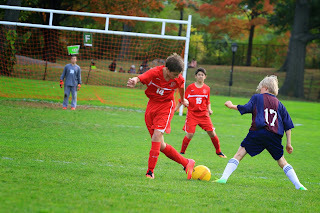 Saint David's White, shown left, however was a different story, defeating St. Bernard's in a strong 2-1 battle to the finish. Mr. Charles Osgood had communicated with members of the faculty earlier in the day regarding the anticipated arrival of his flight from Washington. He'd also penned a letter to be shared with the boys expressing his excitement about the afternoon's game. 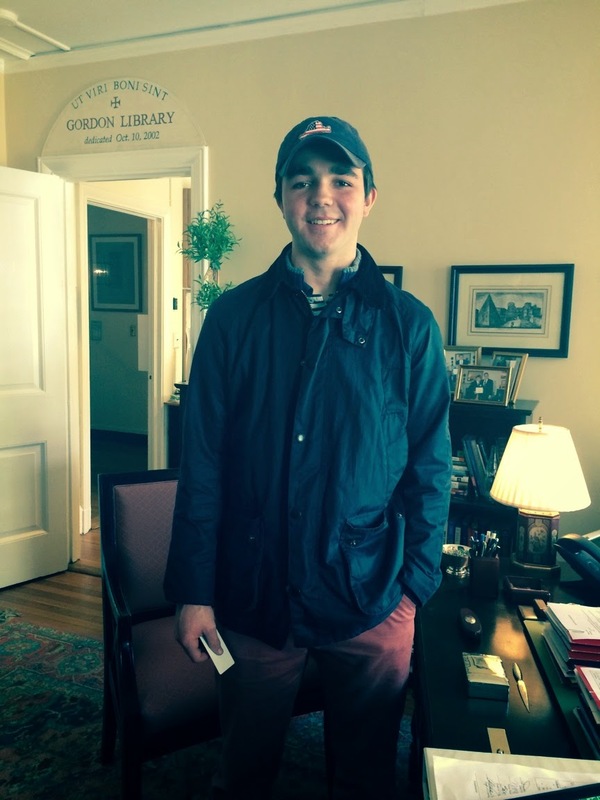 Charles has been an ardent supporter of the school and the boys for decades. Some here believe his association has existed since the very earliest days of the school founding. A man of some mystery, we aren't completely sure if he actually made it to the game, although one of the boys commented on seeing someone "observing enthusiastically from some distance." Next year, Mr. Osgood, next year. 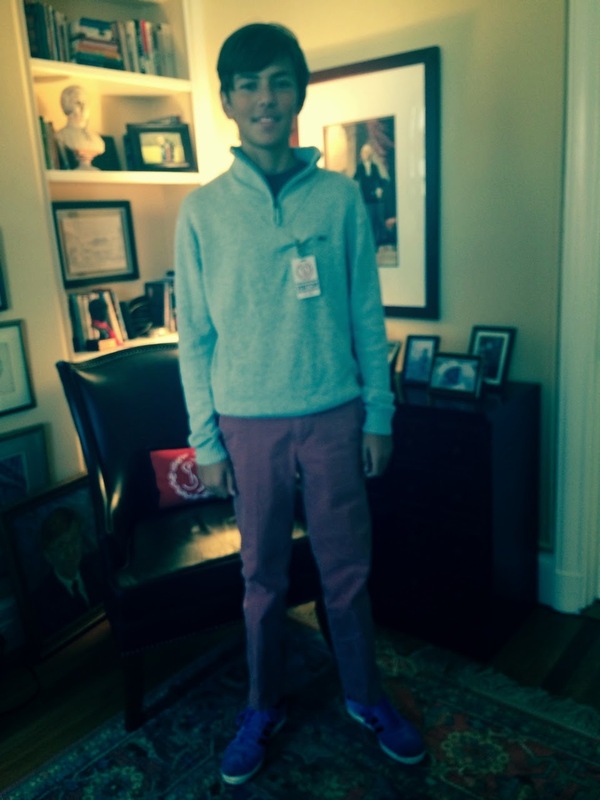 Tyler '14 dropped by the office to say hello Monday. Apparently, he was celebrating a Headmaster's Holiday at Kent or some strange thing. We don't have them here at Saint David's, although the idea is intriguing. Tyler's taking Honors Bio and Honors Geometry, is reading the Odyssey in English (feels well prepared for this one because his old headmaster, yours truly, read him the stories in 3rd grade), and is playing on JV Soccer. Tyler is especially excited about trying out for crew in the spring. At the big game yesterday against rivals St. B's, I had the great fortune to walk home with William '14 and Michael '14 both at Loyola. I snapped a shot on the walk. Having them both slow down long enough to catch this shot was my biggest challenge. Talking about high school and catching up with all that's happened since graduation was the easy part. They are both enjoying high school and feel well prepared. 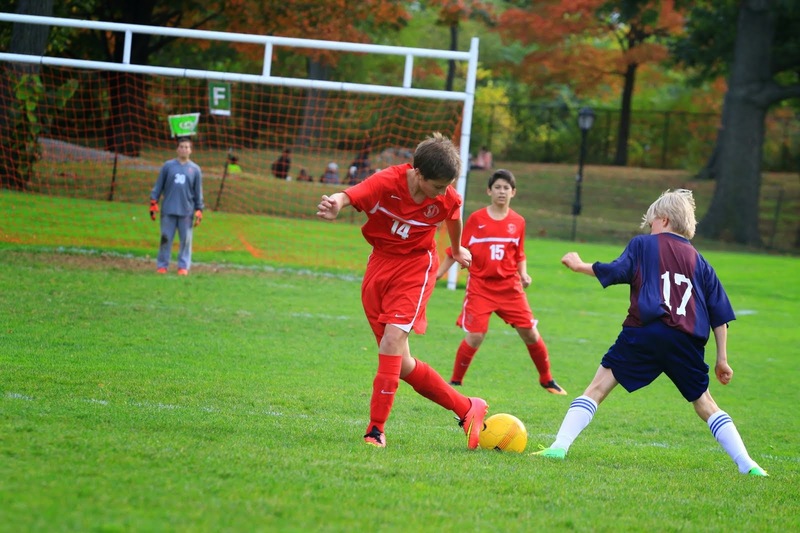 Both Saint David's teams played hard against St. B's in the biggest game of the season. The Osgood Cup, unfortunately, will be placed upside down until this time next year. It's been up for the past three. I suppose a rest was warranted. The boys played hard. It was a shot on goal in the last 50 seconds that clinched the game for St. B's. Today, representatives from two of the educational institutions that Saint David’s has partnered with, visited the school to lead intensive sessions with our boys. This morning, James Basker, President of the Gilder Lehrman Institute of American History, led a workshop for our sixth graders and their parents on “Why Documents Matter.” Our boys in Grade Six and, new for this year, Grade Five, will visit The Gilder Lehrman Collection of unique historical primary source documents as they study several periods in American History, including the Civil War and American Revolution. In these units of study, boys will analyze works such as Paul Revere’s engraving of the Boston Massacre, correspondence by George Washington, and Civil War letters, to uncover insights and information that can only be inferred from careful perusal of original documents. These insights will spark discussion around the "ideas and ideals” associated with the periods of history being studied, revealed through the careful critique of the original source. 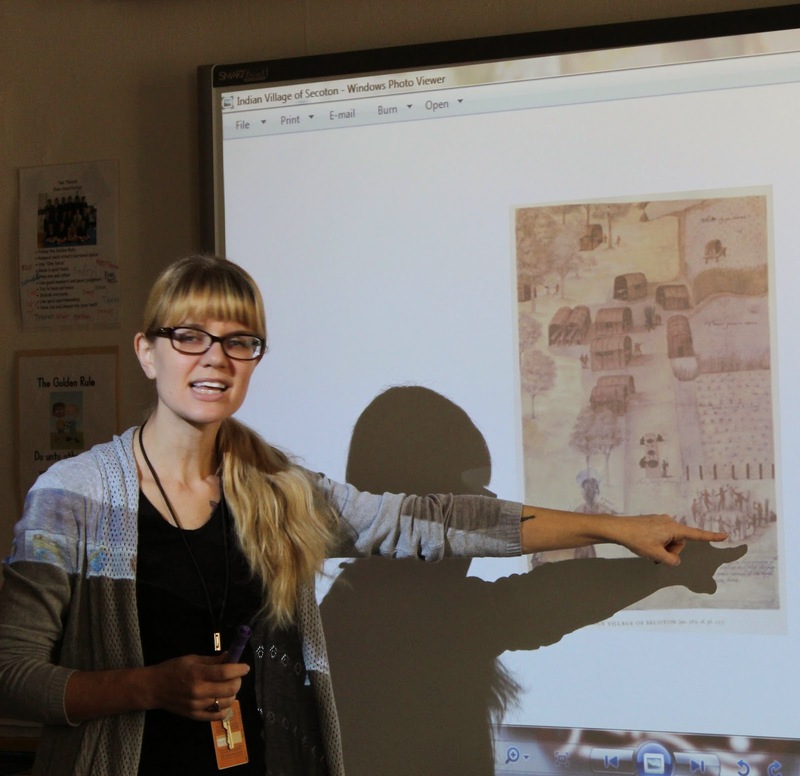 In the afternoon, an educator from the New-York Historical Society began her session on the study of the Lenape tribe of early Manhattan with our second grade boys and their teachers. The boys were led in a discussion of the unique and particular resourcefulness of the Lenape. Guided by their teachers and the educator, the boys will soon create seasonal models of Lenape longhouses and wigwams. Later in the year, boys will study New Amsterdam and examine Revolutionary era artifacts. This is the fourth year of our partnership with the N-YHS and we will be expanding the relationship to our "Mapping New York” unit in first grade, in which boys will explore and study historical maps of New York City from the N-YHS collection. 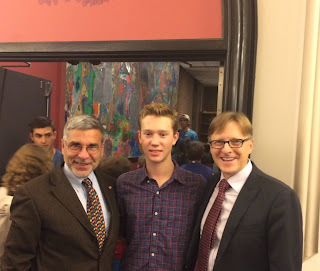 Saint David’s has increased collaborations with cultural, educational and scientific institutions such as the Gilder Lehrman Institute of American History and the N-YHS in order to enhance and further the learning that occurs in the classroom, allowing our boys to explore a topic from a variety of perspectives and uncover deeper meaning from specialists in their respective fields. Scientific inquiry is the diverse way in which scientists study the natural world and propose explanations based on the evidence derived from their work. Scientific inquiry also refers to the activities through which students develop knowledge and understanding of scientific ideas, as well as an understanding of how scientists study the natural world. It is a powerful way of understanding science content in which students learn how to ask questions and use evidence to answer them. In the process of learning the strategies of scientific inquiry, students learn to conduct an investigation and collect evidence from a variety of sources, develop an explanation from the data, and communicate and defend their conclusions. Scientific inquiry can best be accomplished by using the Five E instructional model. 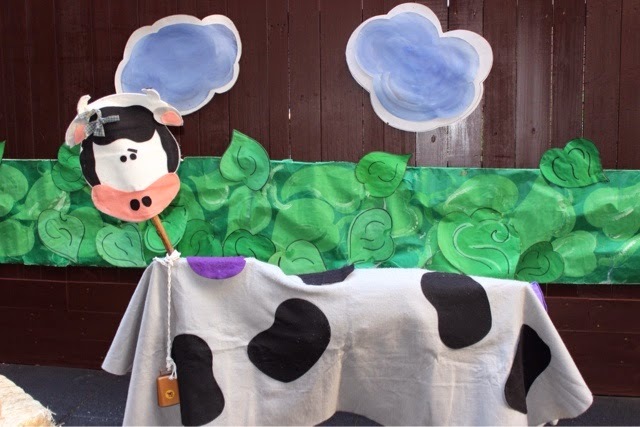 In the first phase, engage, the students are motivated to show interest in a subject. This can be done through an activity or experience that allows them to connect current and past experiences. After students are engaged, they move to the explore phase of this strategy. In this phase, students are involved in activities that help them think, problem solve, or investigate. The activities help students develop an understanding of a science concept, skill, or process. The next phase is to explain or formally present the scientific concept, process, or skill. The explanation phase connects students’ prior knowledge, observations, and findings from the explore phase. In phase four, students elaborate or apply information learned in the previous phases to new situations and ask such questions as: “What happens if . . . ?” or “Can I find a way to . . . ?” In the final phase, evaluate, students work with each other to check their understanding. At Saint David’s, an outgrowth of our Curriculum Initiative has been to increase the opportunities for boys to engage in this type of learning. A prime example can be seen in our new partnership with Cold Spring Harbor Laboratory for a new Fifth Grade DNA Inquiry Unit. This partnership afforded the boys the opportunity to work closely with scientists at the DNA Learning Center (DNALC) and in our own science labs at Saint David’s. 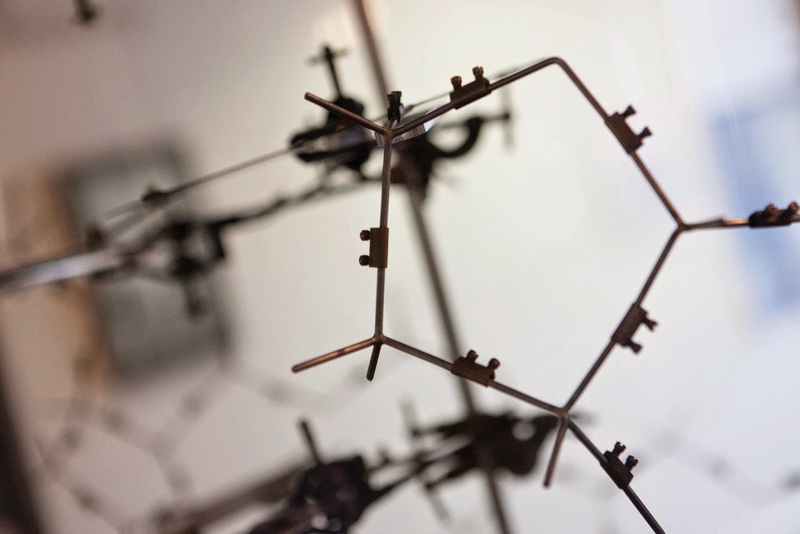 The DNA Learning Center—the world’s first science center devoted entirely to genetics education—is an operating unit of Cold Spring Harbor Laboratory, an important center for molecular genetics research. The Dolan DNALC, DNALC West, and Harlem DNA Lab extend the Laboratory’s traditional research and postgraduate education mission to the college, pre-college, and public levels. The DNA Inquiry Unit consisted of three phases where the boys observed modeling of lab protocol, chose research questions, and worked in teams to create a mini presentation. Phase one gave boys the opportunity to work hands-on with compound microscopes, identify specimens within the kingdoms of biological classification, learn about the structure and function of cells, make a cell model, and extract DNA. 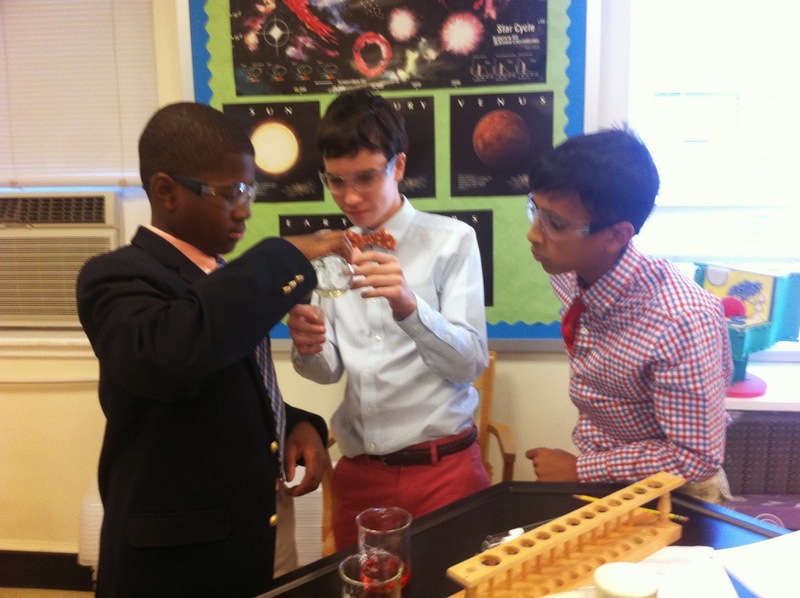 These hands-on activities gave boys the opportunity to become engaged by and explore the properties of cells and DNA.